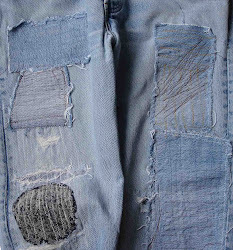 If you have a pair of naft jeans with no personality and you love denim and love the ease of joggers, then why not, follow your love – and crop and recycle those old jeans into something cozy, comfortable and cool to wear? These cropped joggers are easy to make - and quickly become a favorite. Level - some sewing (takes an hour) and knitting (another hour) experience is needed. If you are not a knitter cut the cuffs from a cast-off sweatshirt. 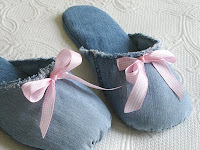 Note: Ribbons were chosen with different weaves and colors to create an imaginative mix and the yarns for how they compliment the ribbons and denim. Follow my lead or rummage through your pile of notions and yarns and do it in another style. Cut your jeans 2" below your knee and zigzag stitch the cut edge. Cut ½ yard off the lime braid and set aside for the loops. With 1/8" overlap, pin the two ribbons together, lengthwise. Baste, remove pins and machine zigzag stitch together. Cut the length in half. Fold back the top edge ½" on one strip, align to the side seam where it joins the waistband and pin along the side seam, to the cuff. Trim any excess ribbon at the cuff. Baste in place, remove pins and zigzag stitch the ribbon around the perimeter. Repeat on the other side seam with the other strip of ribbon. Knit a pair of 1 x 1 rib cuffs. Directions for Small (Medium, Large) sizes correspond to a finished circumference of 3 ½", 4 ½", 5 ½". Note: Check that the measurement will fit snug around your calf and adjust as necessary, adding or subtracting stitches in pairs. With Cotton Denim Aran, cast on 45 (49, 53) stitches. Row 1 (RS) K1, *p1, k1; repeat from * to end. Row 2 P1, *k1, p1; repeat from * to end. These 2 rows form the rib pattern. Repeat these 2 rows for 6 more rows. Switch to Catania and work 2 rows. Switch to Cotton Denim and work 2 rows. Bind off all stitches using Cotton Denim. Cut yarn, leaving a 12" (30.5cm) length. Repeat for the second cuff. Thread the extra yarn length on a knitting sewing needle and matching the stripes, sew up the rib seam on the wrong side. Securely knot all ends so they will not unravel. Repeat for the second cuff. Fold the rib in half and pin the center of the fold to the cuff side seam. 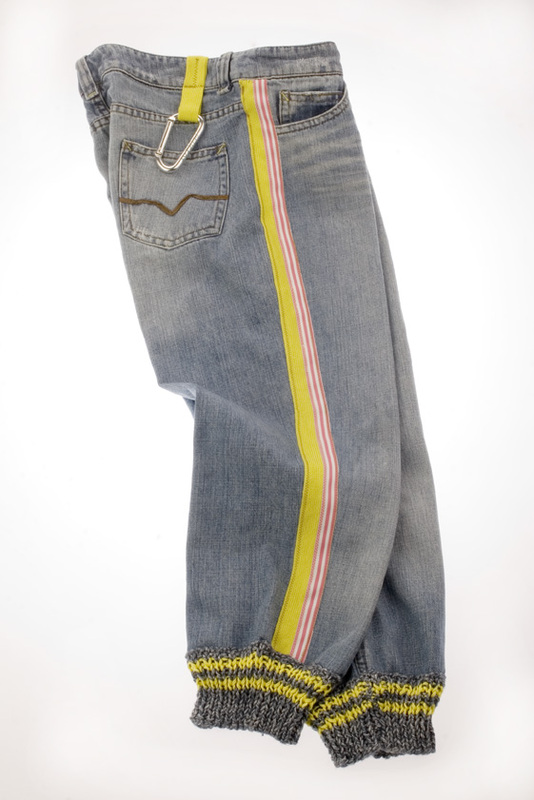 Align the seam of the rib cuff to the inside seam of the denim cuff. Stretch the ribbing, easing the knit rib evenly. 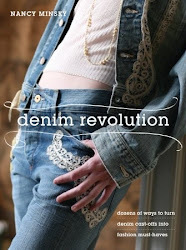 The rib should overlap the denim ¾". Pin, baste and remove the pins. Hand stitch securely with the ochre thread. Remove basting. Repeat for the other cuff. Lightly steam the seam. Cut the remaining lime braid in half. Take one strip, overlap the ends 5/8" and stitch closed to form a continuous loop. Fold it in half. 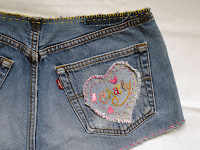 Pin on the front side waistband and fold it over the waistband (like above photo.) Baste, remove pins. Zigzag stitch in a cross as in the photo. Remove basting. Repeat with the other strip, adding a loop on the back waistband. Hook a key carabineer on a loop, snap on a memento or cell phone – and you're off! Enjoy your comfy, cropped, denim-joggers! OH! I LOVE these pants!! Those knitted cuffs are fab! And the stripes, and the loop for the carabineer - I love it all!! By the way, I wear my denim joggers all year long, from layered over leggings in the winter, with converse, fun socks, just every kind of get up imaginable.